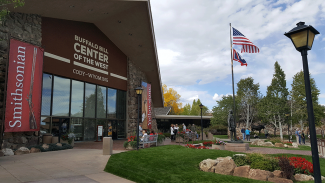 As a part of the year-long Centennial celebration, the Buffalo Bill Center of the West’s Buffalo Bill Museum brings renowned international scholars and museum professionals to Cody, Wyoming, for the highly anticipated Centennial Symposium August 2–4. Robust session topics consider William F. “Buffalo Bill” Cody’s life and enterprises in the context of American Western Studies, including his place in the regional history of settlement, in the popularization of frontier nationalism in America and abroad, and in the development of western historiography. In both popular and scholarly consciousness, the life and times of Buffalo Bill have come to represent a key phase of the American past. From Cody’s early life through his various professional phases—including the decades of the Wild West tours—the Buffalo Bill phenomenon reflects fundamental currents in American culture from 1850 to 1920. Plan to attend the Centennial Symposium at the Buffalo Bill Center of the West August 2–5. Kim Zierlein photo. Each day of the Centennial Symposium begins at 8 a.m. in the Center’s Coe Auditorium. Day 1 opens Wednesday, August 2. Cost of the first day is $40 for Buffalo Bill Center of the West members and $50 for non-members. For individuals wishing to attend all three days, cost is $180 for members and $200 for non-members; the deadline to register is July 28. Lecture topics include the following: Interpreting Buffalo Bill through Public History; Becoming Buffalo Bill; The Persistent Power of Paradox, Patty Limerick; Childhood, Girlhood, and Performing Identity; and The Legacy of Buffalo Bill at the Center of the West. After all presentations, a reception is scheduled to follow at 6 p.m.
Day 2, Thursday, August 3, features the following topics: Promoting and Consuming the Wild West; Buffalo Bill’s Wild West Abroad; Cross-Cultural Family Experiences, Arthur Amiotte; The Wild West and European Nationalism; New Approaches to Cody Studies; and Buffalo Bill in the Borderlands, Louis Warren. Cost of this day is $70 for members and $75 for non-members. Day 3, Friday, August 4, features the following lecture topics: Buffalo Bill’s Wild West in Public Memory; The Wild West in the European Visual Imagination; Buffalo Bill and “Dime Novelitis,” Christine Bold; Multicultural Legacies of the Wild West; Buffalo Bill’s America and the Future of Cody Studies; and Buffalo Bill and the Creations of the Frontier Myth, Paul Hutton. Cost of this day is $70 for members and $75 for non-members. An additional special highlight of this event includes a presentation by Dr. Didier Gondola, Chair of the History Department and Professor of African History and Africana Studies at Indiana University—Purdue University, Indianapolis, titled “Buffalo Bill Cody in Kinshasa: Westerns, Violence, and Masculinity in the heart of the Tropics.” This lecture takes place on Saturday, August 5, at 10 a.m.
To register for the Centennial Symposium, visit tickets.centerofthewest.org. For more information about the symposium as well as the detailed program schedule for each day, visit centerofthewest.org/event/symposium-buffalo-bill-centennial/. Individuals with further questions may contact Jeremy Johnston at [email protected] or 307-578-4032. This symposium is funded through a generous contribution from the Geraldine W. and Robert J. Dellenback Foundation.